A few weeks ago I read a celebrity chef interview in one of those glossy newspaper magazines. The chef, a meat eater, said something that really stuck with me. He said that with daily access to Indian food he could envisage happily being a vegetarian. Similar thoughts have been shared by another famous chef, Rick Stein, in his ‘India’ cookbook – one of the most treasured books in my collection. He talks to the fact that there are over 600 million vegetarians in India and goes on to say ‘….with the amazing enthusiasm that everyone has for food, you quickly realise you could spend the rest of your life never eating meat and be happy’. Rick also explains how a trip to India ‘….challenges you to question whether we really do need to eat so much meat in the West’. Of course for some of you I’m preaching to the converted. You possibly gave up meat years ago or eat much less meat today than ever before. But for others perhaps life without meat remains unthinkable. That’s how I feel about giving up cheese, chocolate and coffee. But when it comes to meat I’ve virtually eaten none for the past year or so, and despite previously being a lifelong omnivore I really haven’t missed it. Maybe that’s in part thanks to my love of Indian veggie dishes….. This brings me to Archana’s dum aloo. Archana’s lovely blog Ministry of Curry features a whole host of mouthwatering Indian delights. Many of which showcase her mother’s recipes that, over the years, she’s recreated for her own family. Just a few days after Archana posted her mum’s signature dum aloo recipe I gave it a go, keen to taste how the dried fenugreek leaves and cashews would come together as key ingredients in the sauce. Dum aloo is north Indian curry made with baby potatoes simmered in an onion and tomato based gravy. 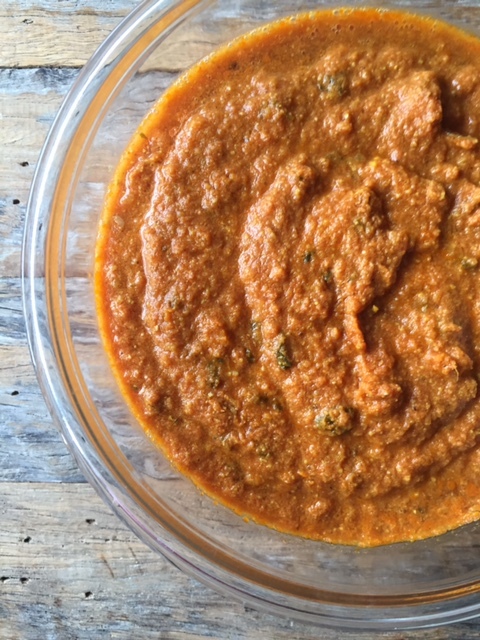 My pictures here simply show the sauce (or gravy) – and although you may add potatoes the sauce is super versatile and would work well with cooked beans, lentils or veggies of your choice. For the full recipe check out Archana’s post for Dum Aloo – Instant Pot. And of course if you’re a fan of Indian food be sure to follow her blog. 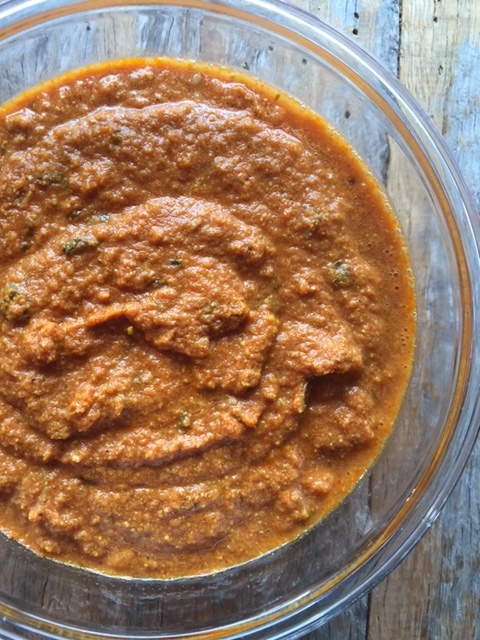 I could’ve picked one of many Indian recipes to sit alongside my ‘pro meatfree diet’ introductory words, but I choose this one from Archana because it’s simply so good. You don’t need a visit to India to re-evaluate your meat consumption. Instead try making this sauce you’ll be that little bit closer to appreciating why so many people, like me, have moved to a plant based diet. Tags: dum aloo, Indian, recipe. Bookmark the permalink. Hi Laura, I am so humbled that you made my mom’s dum aloo recipe and that you enjoyed it so much. Thank you for all the kind words. You made my day! That’s so true Laura – when I visted India I stuck to a vegetarian diet and did not miss meat at all. Thanks Elaine – dark chocolate and coffee I’m convinced have health properties so hard my excuse for not giving those up! Thanks so much for sharing this, Laura. 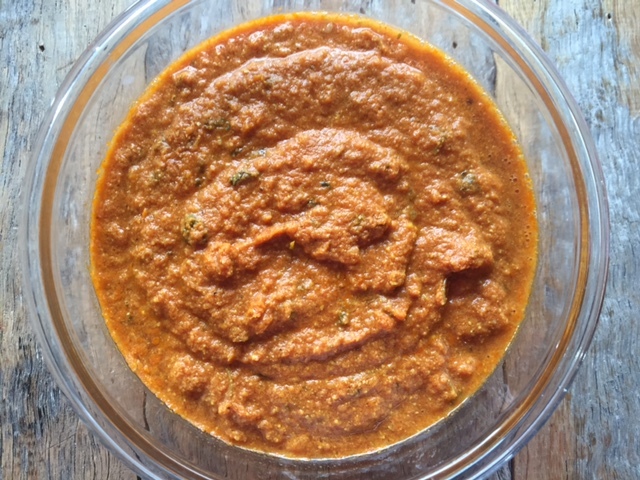 I love tomato based gravies in Indian dishes – so versatile and delicious and this one looks fabulous. Will definitely have to try. It looks so comforting and with the nights closing in earlier this is just the ticket. Very pleased to know that you value vegetarian cooking so much. When nature has blessed us with so many vegetables that are really good for ur health, why only succumb to eating meat all the time. The gravy looks yum. Cheers !! I agree, with Indian food, meat is not missed! Thanks Stacia – glad you agree!